Posts tagged wahlcomputer | jotbe :: Daily. Showing only posts tagged wahlcomputer. Show all posts. Posted by Jan Beilicke on Fri 01 December 2006 in articles. 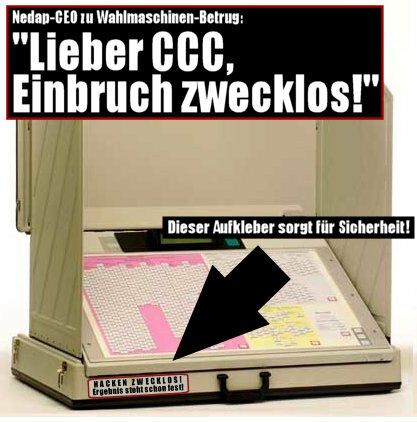 archived Tags: unsortiert, wahlcomputer. Posted by Jan Beilicke on Thu 02 November 2006 in articles. archived Tags: unsortiert, hamburg, wahlcomputer. Posted by Jan Beilicke on Fri 20 October 2006 in articles. archived Tags: demokratie, unsortiert, wahlen, wahlcomputer.